That's right, the pinnacle point of the cluster f--k.
Many people read this diagram as the product manager being involved in the decisions as it relates to UX, the tech decisions, and where the business is going. 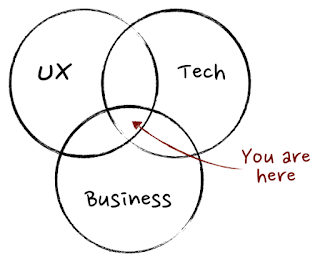 While this is very true, a product manager is also a supportive role. What that means is the designers, developers and business leaders will have questions, a lot of questions, and it's the product manager's job to answer them or find an answer, somewhere. Finding that answer may come from inside the company, but as a company grows, it'll be harder and harder to find the right person, or worse, answers may differ between different business leaders. Having multiple opinions will create a broken user experience in the product. The product manager normalizes the feedback, collects more, and combines it with long term direction creating a cohesive story for end-users using a product. So if not all the answers come from inside the company, where do they come from? A product manager should know exactly what their customers want, at all times, about each key feature in their ownership. There is no excuse, except perhaps for initial for ramp-up periods. A product manager brings the voice of the customer to the table. It doesn't matter if the product is supposed to make millions (a.k.a. "Business"), it looks beautiful (a.k.a. "Design"), or is a masterful architecture of tech-greatness (a.k.a. "Tech"). If it's not targeted towards a market and a set of customers, it'll end up in the bit bucket. Telemetry - Data-mine the heck out of the product as it provides daily insights! What are customers using,? What are they not using? How long is it taking customers to go down a funnel? Where are the drop off points? What does A/B testing tell you? Support - Current customers are calling to tell you what's broken, what they want, what they need. Pick up a phone and listen. Follow up with some of the more interesting ones that align with business the business direction. Sales - Potential customers are on the phone as well, what do they want? Why didn't they choose your product? Why did they? What would make it a slam dunk for them next time around? What competitors are they considering and why? Round Tables/Advisory boards - Get your key customers in a room together, or on a webinar and let them voice their favourite features (don't mess with this, or improve incrementally for low-hanging fruit), and their feature wishes and hated features. Let them talk to each other as well. Conferences - Not yet potential customers who could be potential customers, who may have never heard about the product or company. Get their reactions, what do they like, what don't they like. Are they extra engaged on key features, do they call out features that should be there? And my favourite, let your customers sell other potential customers on the product and see what they think are the key features. Site visits - Just like a lion safari, watching the users in their natural habitat is irreplaceable. Watch where they get tripped up, ask them why they chose one way over another way. There is a lot to learn. The caution on this one is to make sure you do multiple site visits so there isn't an overly tailored and specific request for one customer, geographic or vertical. Calling or E-mailing - Calling works better than email (less noise these days), but simply calling a customer with a question or two, and potentially a perk to get their attention (1 month free for example). A ton of insight can be gained by talking directly to a customer. User Studies - These are expensive, but super informative to study behaviour. It's like bulk sight visits sitting behind one-way glass. You often need a person or company to find and orchestrate the study on behalf of your company. If you do this, attend a number of sessions, it's completely eye-opening. There are many ways to connect to customers, these are my favourite eight. The absolutely key thing in all of these is to listen, and then listen some more. Then take notes before the memory fades. Lastly, once the customer is understood, to help other disciplines understand the customer, it's not a bad idea to put together a single page for the persona(s). This single page is an "average" customer that takes the 100s or 1000s of customers met, and makes up about 80% of their needs, wishes, and thoughts. I like to print these out on a piece of paper and stick them up around the office. They have a "fake" name and picture, details about what they do and care about, enough to get the other disciplines aware of who they are building for. The plus is if an engineer needs to make a snap decision while the product manager is at a conference or site visit, they can do just that and get it 80% correct! Got a suggestion on how you like to connect to customers? Drop it below. You should know your client very well. This is true. You can drastically change the conversion! Great article, good tips in it. I just want to add that if someone seeking for help with a management, you can get it here. The Dissertation Proofreading Services at Students Assignment Help are available 24x7 at a cheap price. The professionals we have in our team deliver a high-quality work in a short time period. snapseed for pc Getting quality pictures for a vast array of media is an essential desire of a large chunk of individuals. 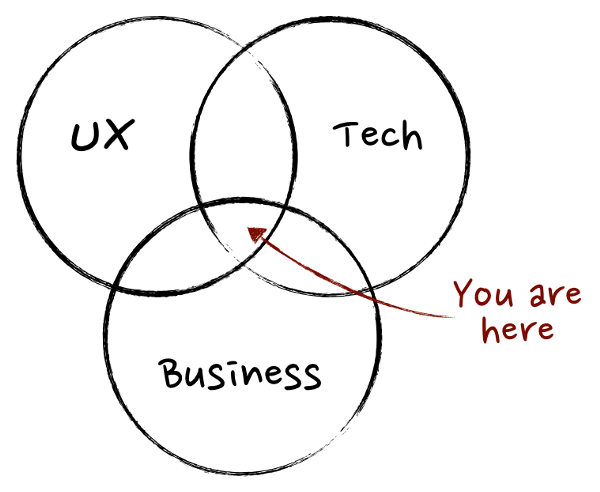 When Should a CEO Hire a Product Manager?